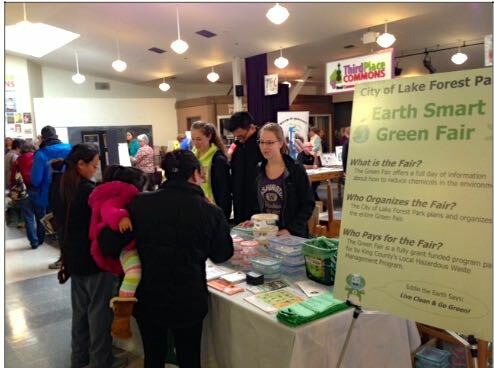 On March 11, nineteen of the City of Lake Forest Park’s local groups, organizations, and community partners hosted educational booths at the Earth Smart Green Fair at Third Place Commons. This year’s giveaways were reusable cloth napkins, grocery and produce bags, kitchen compost bins and bags, glass food storage/lunch containers, pet waste bags, educational brochures, and more! The Green fair is funded by the Local Hazardous Waste Management Program, put on by the City, and hosted at Third Place Commons.